This Android tutorial is to demonstrate an application that will connect to the Twitter and read the tweets and display it. We will use the Twitter 1.1 API to access the tweets by authenticating via OAuth. We will be using the gson-2.2.4.jar for parsing the Json response. Apart from the gson API we will not be using any other third party APIs, just plain Java will do the job. This Android example application is simple and powerful. We Android fans can build our own Twitter client using this as a base. With very little modifications this can be used as a generic Json feed reader or this can be even customized as a web application or a desktop client. I have layered the files for easy separation based on its responsibilities. Following are the key subsections in building this Twitter feed reader Android application. 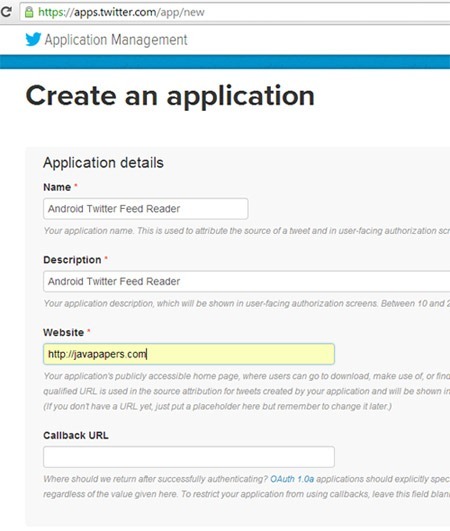 We will use the Twitter OAuth2 API to authenticate with the Twitter backend. From Twitter 1.1 API we need to authenticate to read the tweets. We will follow the standard OAuth communication protocol for authentication. Previously we did a web application to authenticate with Facebook using OAuth. It gives more detail about the OAuth steps to be performed for authentication. 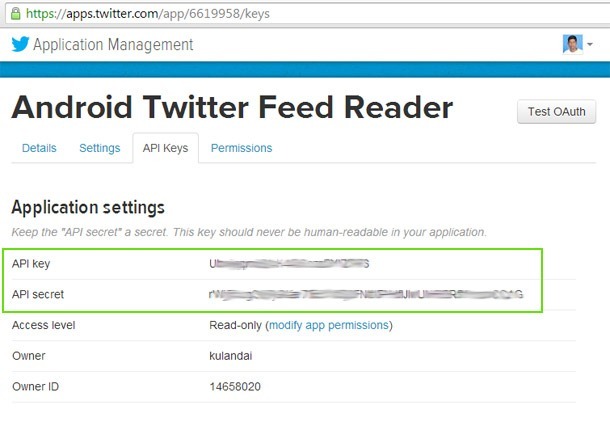 We need these API Key and API secret to access the Twitter tweets. Keep those secret and they are like password. We need to make the network calls in Activity independent way using an AsyncTask. All it does is accesses our own custom Twitter API to authenticate and read the Tweets. Once the Twitter tweets are read successfully then it forwards the content to the Main Activity. Sometime back we gone through a tutorial which explains to build an Android custom ListView using cards view. This completely explains how to build the UI for this application. Following are the util classes used to peform other supportive tasks. Download the project application source to get the complete files. 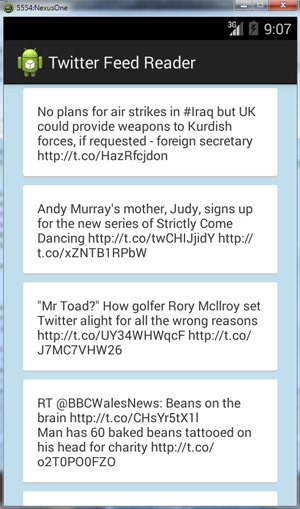 Comments on "Android Twitter Feed Reader"
thanks for sharing the code. Its working fine. But one problem I am facing that I am able to retrieve 20 tweets only. Is it possible to retrieve all the tweets? Many thanks on a great tutorial. 1) What do I need to change in order to click on the link in a tweet? 2) Is it possible to retrieve more than 20 tweets? / or how to filter tweets by #. Comments are closed for "Android Twitter Feed Reader".